This week, Secret Golf is at THE PLAYERS Championship at TPC Sawgrass. Everyday, Knoxy will be doing shows with Golf Talk America, bringing you all the action from Ponte Vedra, Florida. 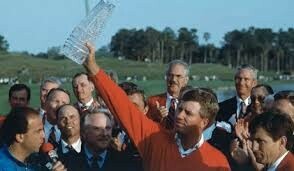 THE PLAYERS is always an exciting tournament on the TOUR schedule but one that means an awful lot to Steve Elkington - Champion in 1991 and 1997. Throughout the week, Knoxy talks to Elk about those wins. They talk about the shots, the stats, the nerves and the big moments that led to the celebrations on the 18th green. On this podcast, Knoxy delves deep into the life-changing win of 1991.